В 1925 году, после приобретения лицензии на конструкцию Рорбаха с гладкой несущей обшивкой, компания "William Beardmore & Co. Ltd" получила заказ на два больших гидросамолета и еще на несколько - с сухопутным шасси. Гидросамолеты, каждый с двумя двигателями ДальшеMore>>> Napier Lion, были построены фирмой "Rohrbach Metal Aeroplane Co. A/S" в Копенгагене и отправлены в Феликстоув для оценки. Там ему дали имя Beardmore Inverness. В Великобритании инженеру фирмы "Beardmore" У. С. Шеклтону поручили создать более крупный самолет с сухопутным шасси Beardmore Inflexible. Детали его конструкции доставляли автотранспортом в экспериментальный центр авиации и вооружения (А&АЕЕ) в Мартлешем-Хит для сборки, 5 марта 1928 года машина впервые поднялась в воздух. Первый полет показал, что Inflexible слишком тяжел для имеющейся силовой установки из трех двигателей Rolls-Royce Condor. Машину показали военным на британской авиабазе Хэндон 30 июня 1928 года, впоследствии ее разобрали в Мартлешем-Хит, где до конца 1930 года она использовалась для исследований воздействия коррозии. IT is an undoubted fact that size as such exerts a peculiar fascination on the majority of people. We experience it in nature, in buildings, in ships, and in aircraft. The magnitude of mountain and ocean, the towering of the skyscraper, the colossal bulk of the ocean liner, all have an appeal which can be traced back to size. Even in aircraft we do not escape it. We may have our doubts as to the efficiency of a very large aeroplane, but in spite of ourselves we are impressed. Probably without putting the thought into definite form we are impressed by the feat of getting so many tons of inert matter into the air. And in the earlier days of aviation it was quite a common view that if one only built a machine large enough, it could fly across the Atlantic. (We are writing now, of course, of the days when the possibility of doing so was rather remote.) How that view came to gain ground is not very easy to imagine, except that the appeal of size was in all probability at work. A fundamental law, which we cannot escape, decrees that if we take any small aeroplane and build an enlarged version of it, geometrically similar in every way, the area of the large machine will vary as the square of a linear dimension, while the weight will vary as the cube. Thus fundamentally the large aeroplane is fighting against a natural limitation. No aircraft designer denies this law, but there are those who maintain that, as we do not make our large machine geometrically similar to the smaller one, the law does not apply. Thus it is claimed that by making refinements in the details of the construction, refinements which become possible in the large machine but were out of the question in the smaller one, sizes far beyond those indicated by the plain W3/2 law become practicable. 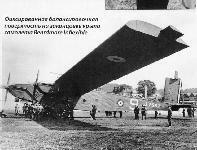 In the Beardmore "Inflexible," a large monoplane of Rohrbach design, constructed at the Dalmuir works of Wm. Beardmore and Co., we have an interesting attempt at "beating the W3/2 law." The Beardmore "Inflexible" is, as the accompanying illustrations show, a monoplane of very large span (about 158 ft.), and equipped with three Rolls-Royce "Condor" engines. The machine is of all-metal construction, including the skin of wings and fuselage, which is of Duralumin. Steel is used for a few highly-stressed fittings, but for the rest the entire machine is built of Duralumin. The general principles of construction are those adopted by Dr. Rohrbach for a number of years, and include the use of a form of metal "box" to form the wing spars, the sheet-metal covering being laminated and the number of laminations depending upon the stresses at any particular point. At present no information concerning the performance of the machine is available. 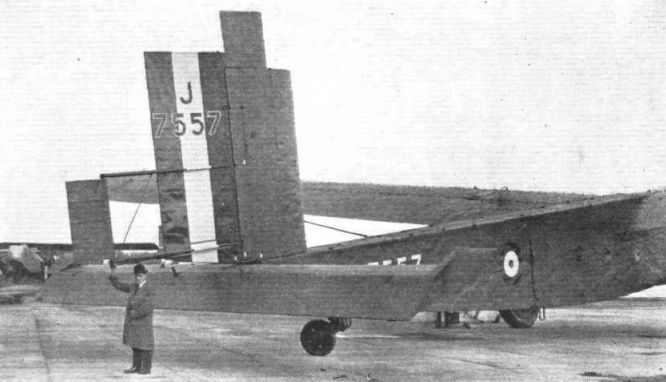 The "Inflexible" is known to have been tested in flight at Martlesham, and is reported to have flown very well and to be very controllable. 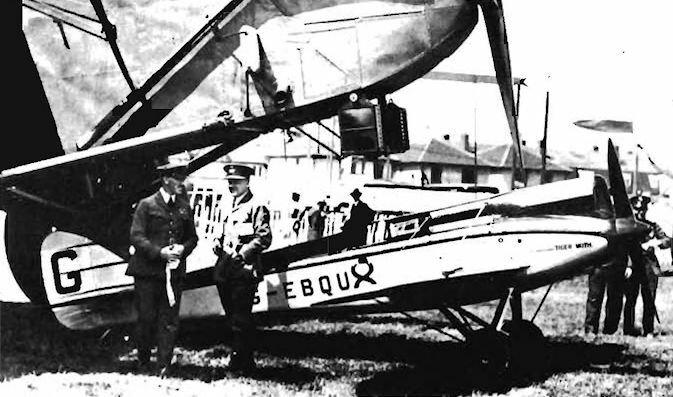 Features of the design visible in the photographs are the large span, the balanced control surfaces, and the Flettner type servo-rudder. The large Dunlop wheels must have presented a pretty problem in design, having to carry a load of something like 7 1/2 tons each. 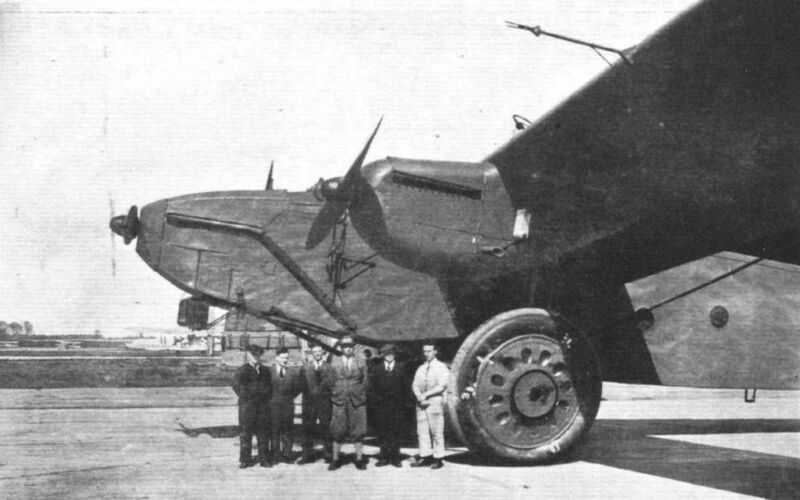 We had occasion to refer recently to the alleged characteristics of a large machine designed by Herr Dornier, and expressed the view that, with the weight and dimensions given, the machine would be unable to get off. In the case of the Beardmore "Inflexible" it can easily be shown that the induced drag of the wing has been reduced to quite a low figure. The span is approximately 158 ft., and the loaded weight is given as in the neighbourhood of 15 tons. Assuming these figures to be approximately correct, the value of Span 2/W is 0-74, which is very much higher than is usually found in large aeroplanes. In fact, a value of 0-3 is not uncommon. As the power loading is round about 16 lbs./h.p., there is no reason whatever why the "Inflexible" should not have quite a good performance. Its great size has, not unnaturally, given the wags an opportunity to exercise their wit, and the machine has been variously nicknamed the "Incredible," the "Impossible" and the "Brittle." The last name presumably comes from an assumption that anything which is inflexible must be brittle. It is to be hoped that detail information may soon become available as the machine is a most interesting experiment. Apart from performance figures, it will be particularly interesting to learn what percentage of tare weight to gross weight has been attained. We gather that the useful load is a good deal greater than most people would imagine. THE "Inflexible," built at the Dalmuir works of Win. Beardmore and Co., Ltd., is in many ways one of the most remarkable aeroplanes of modern times. With a wing span of 158 ft. and a weight of more than 15 tons, this is certainly one of the largest machines actually flying, although types are reported to be under construction abroad which promise to eclipse the "Inflexible" in point of weight, if not in the matter of wing span. The "Inflexible" owes its inception to the German designer Dr. Rohrbach, although the design staff at Dalmuir, headed by Mr. W. S. Shackleton, who has now, for reasons connected with his health, transferred to Australia, naturally did a large amount of the detail work. The machine is a high-wing monoplane, and should be very efficient aerodynamically. The large span assists in reducing induced drag, while the fuselage, in spite of its actual size, forms a very small percentage of the wing span. The two wing engines, too, although they are Rolls-Royce "Condors" of 700 h.p. each, appear almost ridiculously small under wings of such large dimensions, and altogether there can be little doubt that the aero dynamic design is very efficient. Turning to the structural side, it is much to be regretted that Wm. Beardmore and Co. refuse to divulge anything whatever concerning the empty weight of the machine, and of the proportion between tare weight and gross weight. Without knowing anything of these, it is impossible to form any idea as to whether the machine is likely to be of practical use. As an experiment in large-scale research it is certainly very interesting, and at least it can be claimed that the machine has flown and is reported to handle very well indeed. That in itself is something of an achievement, since the problems connected with the control of such a large machine might well have proved somewhat difficult. It might be pointed out that balances of an unusual form are employed so as to lighten the loads on the pilot's controls, while in the case of the rudder a servo-rudder, of the type originated by Herr Anton Flettner, is fitted. This type of servo-rudder has been experimented with a good deal in England during recent years and appears to perform its functions well. Without going into detail concerning its action, it may be pointed out that the pilot operates the servo-rudder which, under the action of the air forces upon it, in turn actuates the main rudder. Thus, as the servo-rudder itself can, if necessary, be balanced, it would appear that control surfaces of any size can be operated. The "Inflexible" is of all-metal construction, and in this instance the wing and fuselage coverings are not excepted, as these also are of metal and, in fact, form part of the stress-bearing structure. The fuselage is of rectangular section, with an internal framework of Duralumin, covered with flat Duralumin sheet. The monoplane wing is set at a pronounced dihedral angle, and is, like the fuselage, built entirely of metal, mainly Duralumin. Dr. Rohrbach makes use of a form of construction in which the front and rear spar, together with the wing covering, form a box to the front and rear of which are attached the leading and trailing edges. By varying the thickness and number of laminations in the covering, the strength can be proportioned to the stresses at any point. Although the wing is designed as a cantilever beam, there is a single wire on each side bracing it. This wire is, perhaps, to be regarded as a torque wire rather than a lift wire, and is attached to the rear spar, or rather, to the rear corner of the box formed by the two spars and the covering. Thus, in a steep dive, with the centre of pressure situated well aft, the wire helps the wing structure to resist torsion. 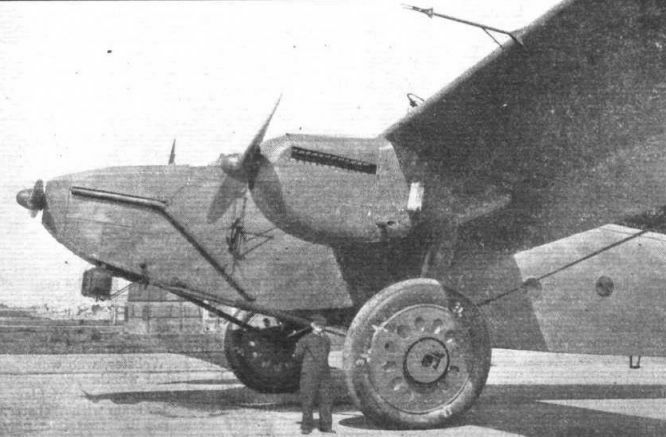 Of the three Rolls-Royce ''Condor" engines, one is mounted in the nose of the fuselage, while the other two are slung under the wing, some distance outboard. The radiators for the outboard engines are mounted under the wing, between the engine nacelle and the fuselage. The undercarriage telescopic struts are taken to the wing, while horizontal Vees take the place of the usual single axle. The large Dunlop wheels are provided with brake drums, the mechanism being so arranged that the tail skid takes a part in the operation of the brakes. As soon as there is a load on the tail skid the brakes are applied, but should the brake pressure be too great, so that there is a tendency for the machine to nose over, the mere fact of the skid leaving the ground immediately releases the brakes. The "Inflexible" is a very interesting experiment, and the results of exhaustive tests should be of very considerable value to the future development of the large aeroplane. Один Rohrbach Ro VI в середине 1920-х годов был построен компанией "Beardmore". Ro VI с размахом крыла 48,00 м до начала Второй мировой войны оставался самым большим британским сухопутным самолетом. Самолет получил серийный номер J7557, утилизировали его в 1930 году. The Beardmore "Inflexible" was an interesting experiment in size. Its wing span was more than 150 ft. Like a good many other very large machines, the weight of the structure was somewhat great, and the useful load correspondingly reduced. Nevertheless, the machine has been flown in public on several occasions, attracting great attention. 5 марта 1928г. : впервые взлетел самолет "British Beardmore Inflexible", оснащенный тремя двигателями Rolls-Royce Condor по 650 л. с. (484 кВт). Видна фиксированная балансировочная поверхность на законцовке крыла. 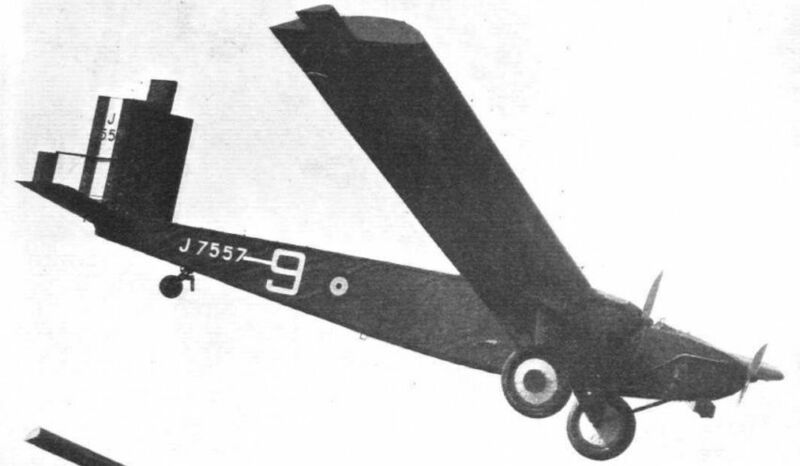 The sole example of the Beardmore Inflexible built to investigate the possibilities of what were considered (in the 'twenties) to be ultra-large all-metal monoplanes. Самолет Inflexible с гражданским номером G-EBNC закончил свою карьеру в качестве испытательной модели для изучения коррозии. 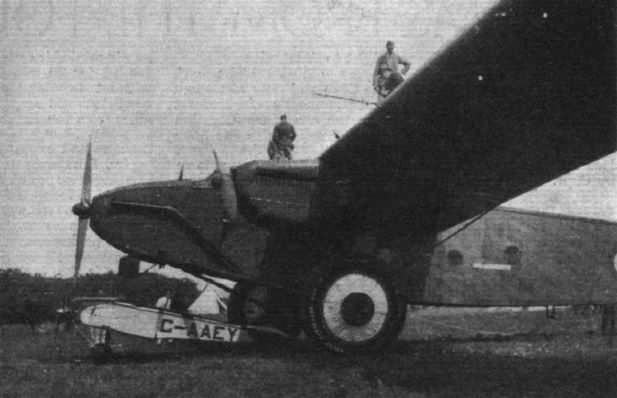 BEARDMORE "INFLEXIBLE": Transport Monoplane, with three Rolls-Royce "Condor" Engines. THE BEARDMORE "INFLEXIBLE": With a wing span of 158 ft., and a total loaded weight of about 15 tons, this machine is an interesting experiment in beating the scale law. Three-quarter front and three-quarter rear views. The Beardmore "Inflexible": A view of the three Rolls-Royce "Condor" engines. The man standing in front gives a good idea of the size of the machine. Note particularly the large Dunlop wheels. DIGNITY AND IMPUDENCE: The Gadfly goes to bed beneath the nose of the Inflexible! EXTREMES: Beardmore "Inflexible" (Condors) leading the parade. NORWICH AIR DISPLAY: The Beardmore "Inflexible" monoplane of 1950 h.p. 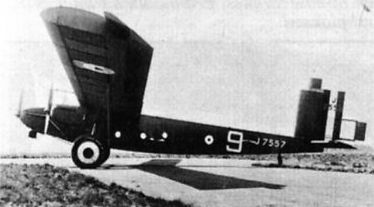 The Beardmore "Inflexible": View of the tail unit. Note the balances and Flettner servo-rudder.